Our feature flowers this weekend are petunias! 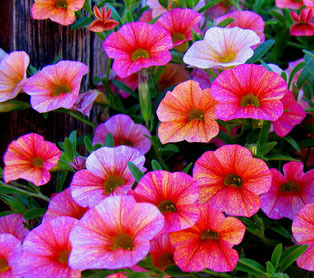 All four pack flats (8 four packs) of petunias are on sale for $12! That means you get two four packs for free! Feel free to mix and match different colors! Come get your colorful petunias today! This weekend all roses are 15% original price! All coco fiber hanging baskets are still 50% off and we have replacement coco fiber available for sale as well! We have all your gardening needs including soil, seeds, a variety of annuals and perennials and much much more! !